This is just a few impressions and thoughts. This area is very hilly and dry. One is going either up or down. Much rocks and rubble from demolitions, etc. Meet a man yesterday who said that the occupation should not come as a surprise since it is prophesied in the Koran. There it states that the occupation would last 80 years so he is quite accepting of it. Allah’s will be done and it will be in his time. Today we went to a village in Area C – under total Israeli administrative and military control. Watch towers are everywhere and there is also a military firing zone so that all the villages in the area are under demolition orders. The one village had an Israeli settlement about twenty meters away. The homes there were nice and had running water and electricity. And trees and other vegetation. And going to it was on a good road. The homes in the Palestinian village were demolished but some stayed and put up shelters. One young fellow (he could talk some English) hollowed out a large cave-type hole in the ground by hand out of rock with only a pik axe. It is to collect water in the rainy season.They also had some sheep, goats and chickens. His one brother was beaten several years ago by the settlers and was now handicapped. An aid agency brought a special toilet for him to use but the Israeli army took it. The young fellow also said that he wishes the settlers would just talk to them and have tea with them and they would see them as people. But instead they (the Israelis) push and push and do everything to make life difficult and discourage them. If a Palestinian pushes back, he is called a terrorist. 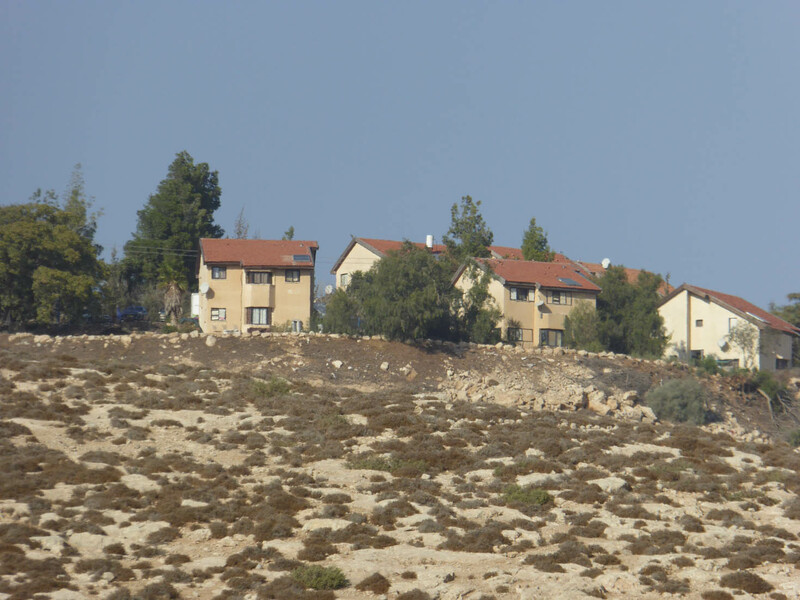 Israeli Settlement within sight of small Palestinian village. Next we went to a school opening in Birin. Some officials were there and, after the ceremonies, we were given lunch – rice and sheep meat. The people are extremely friendly and we get tea or coffee not matter how desperate and poor they are. Another village in the hills was also demolished about 4 months ago and piles of rumble everywhere. The Red Cross had brought two tents which were still up. (Now the Red Cross no longer brings tents since they are usually just taken away by the Israeli military.) One agency in the last two weeks or so has put up homes but there are no floors in them or anything else. They are much like the medal tool sheds we can buy at Home Depot but bigger. No floors and the rain can come in under them as well as the snakes and scorpions.The people there – about 20 in total, really have nothing but we were welcomed and given tea. This is all for now. Getting late. Posted on October 23, 2014, in October. Bookmark the permalink. Leave a comment.